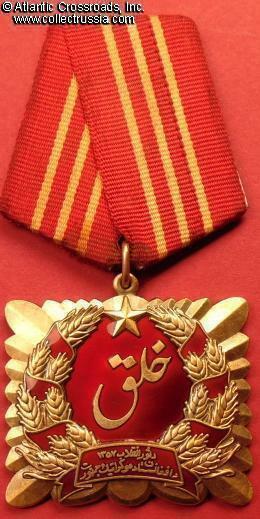 Order of the Saur (April) Revolution, Type 1, #0653, 1978- 79. 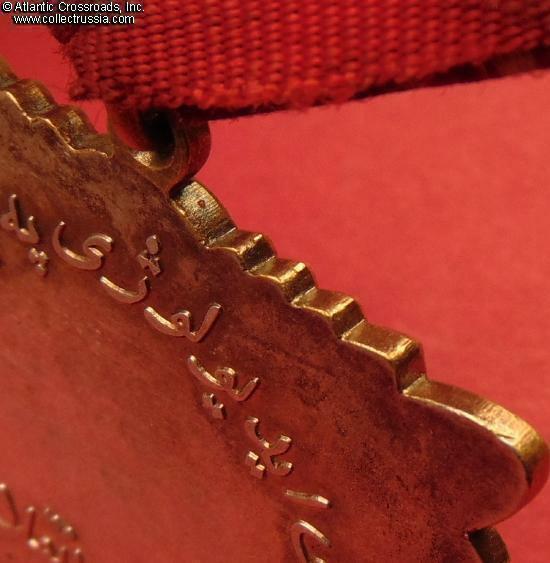 The medallion is in silver gilt and enamels, measures 42.6 mm in height incl. eyelet, 45.2 mm in width; weighs 48.0 grams not including the suspension and connecting link. Extremely massive and well-made piece. 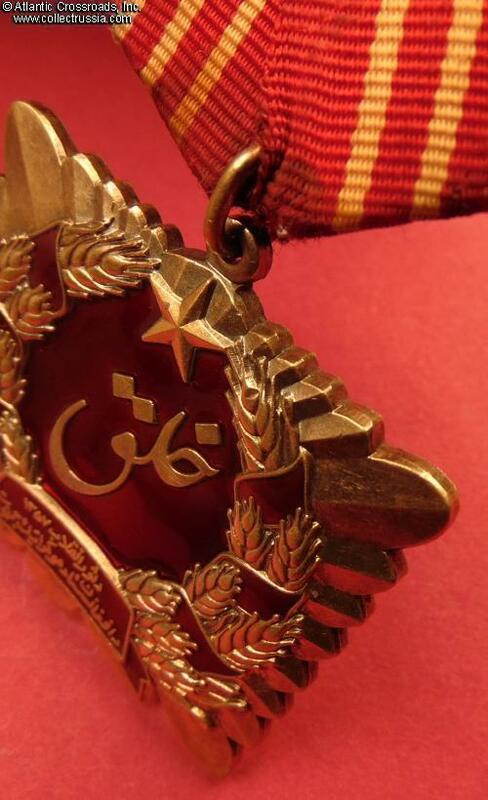 The center of the obverse shows the Khalq (or "People") legend in Pashto language. 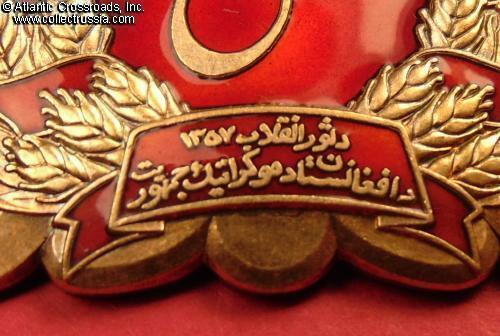 The writing in the plaque below is "Saur Revolution (of the year of) 1357 - Democratic Republic of Afghanistan. The date of 7 Saur (Sawr) 1357 corresponds with the 27 April 1978 of the modern Christian calendar. 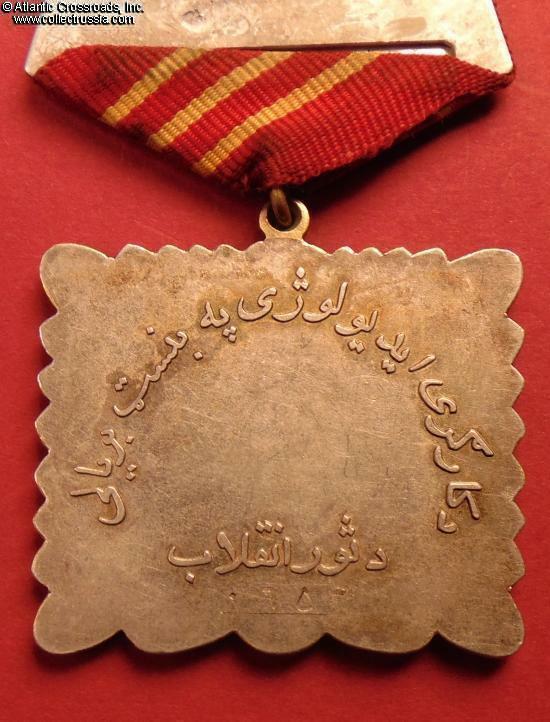 There reverse has raised inscription in Pashto "For the Glory of Workers and Peasants". 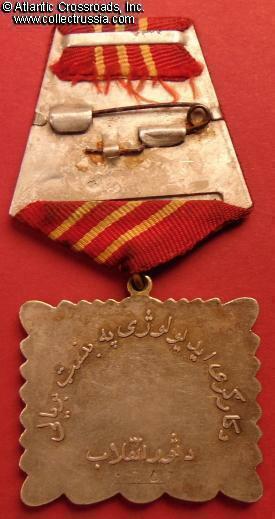 There is a stamped individual serial number "0653" in Dari / Pashto numerals on the reverse, near the bottom. In outstanding, excellent condition. The obverse is pristine. The enamel retains all of its beautiful original luster. The gilt finish is likewise beautifully preserved and bright. 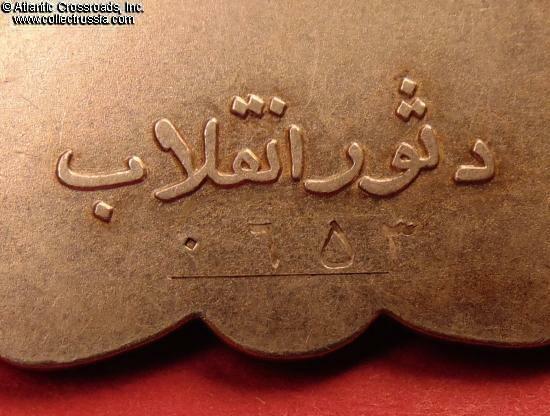 The reverse has very attractive even patina to silver. Comes with original suspension and very lightly worn, well-preserved original ribbon. The connecting link is original and has not been cut. 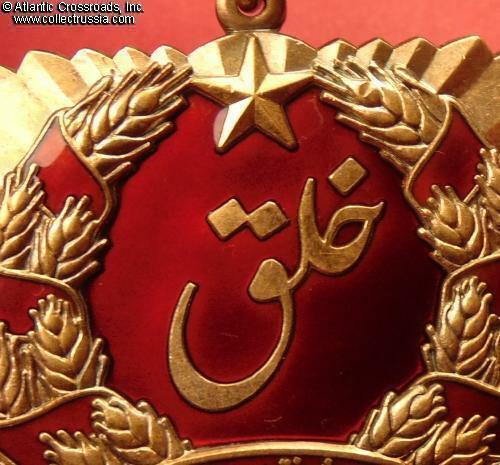 Like the other Afghan decorations, this piece was made at the Soviet Mint, but it is of far better quality than the others issued by the subsequent, Soviet-controlled regimes. 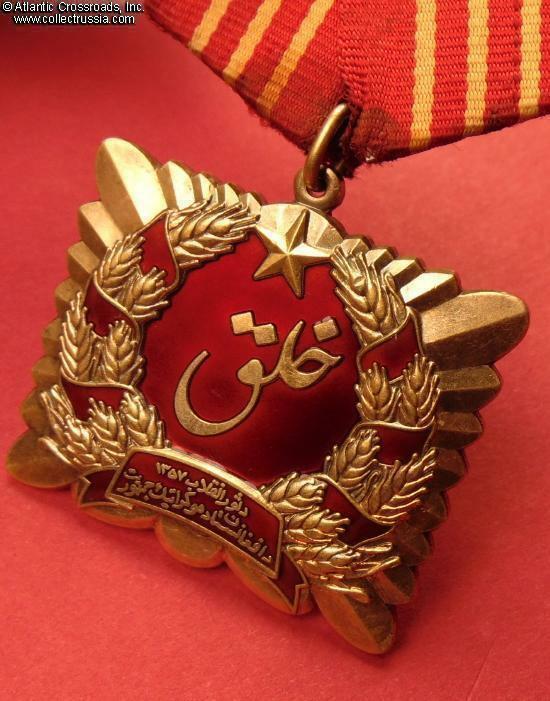 One of the highest awards of Communist Afghanistan, it was bestowed mostly upon top political operatives. 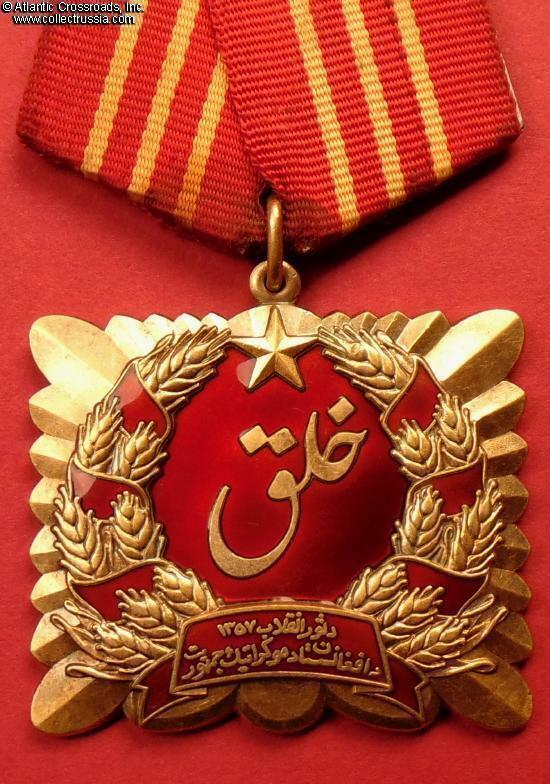 Reportedly, no more than 130 of the Type 1 were awarded in total during the Khalq regime, before the Soviet takeover and the complete redesign of this decoration. Of course, there might have been more decorations actually made than bestowed, but judging by the serial numbers of all the surviving specimens that have been observed to date, no more than 999 specimens were ever produced. Many have been destroyed in the years of incessant civil wars and foreign interventions that followed the initial communist revolution.